$40 ticket includes dinner. Click Buy Now to the left to purchase tickets to the Comedy Machine Dinner Theatre. You will be re-directed to PayPal. A PayPal account is NOT required to complete the transaction. Read Terms & Conditions of Sales page on this website. 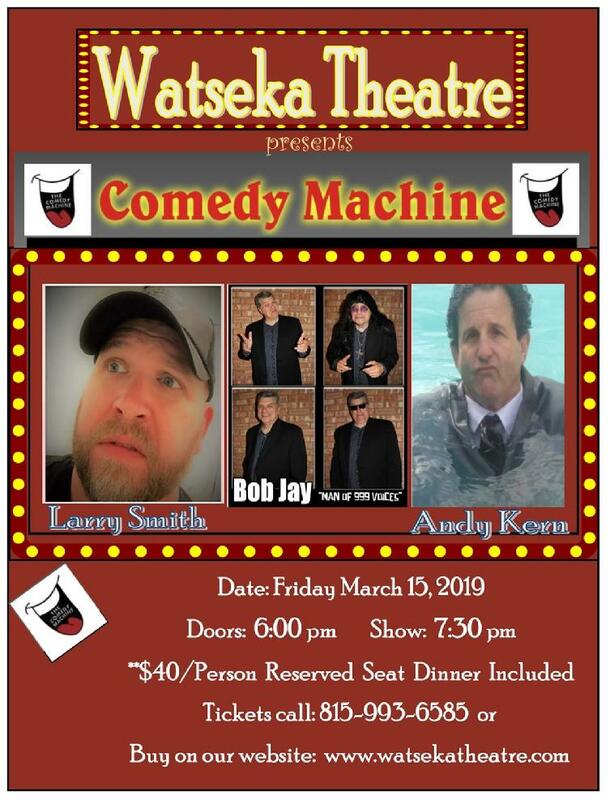 $28 reserved ticket only- NO dinner included- to Comedy Machine 3-15-19. Read "Terms & Conditions of Sales" on this website. TONIGHT, FOR YOUR LAUGHING PLEASURE, we bring you an evening of dining & comedy. Three comedians that deliver. Dinner served prior to the show & is included with your ticket. Menu to be determined with vegetarian & gluten-free options available.